Oaxacan artist Olivera’s gorgeous oil paintings, saturated in rich, bold colors, are full of “magic realism,” where fishes and otters swim in and out of Lucía’s hair, butterflies fly in and out of her skirts, and her sorrow at the behavior of the villagers is palpable. Olivera’s Zapotecanas are big and beautiful, and his Lucía is lush and glorious—a dark, zaftig Indian woman, with big hips and big feet, a Mother Earth figure. The book, winner of an Outstanding Children’s Book Award from Parenting Magazine, has garnered numerous positive reviews praising it for its strong moral message about kindness and understanding and respect for nature and responsibility for the earth. As a long-time educator, I’m always looking for children’s stories that teach conflict resolution by encouraging kindness, caring, empathy and respect. So, after the first reading, I really liked this story. But there was something about it that made me vaguely uneasy. A second read and a critical look at the copy at the back of the book made me think more deeply. “Alejandro was killed in 1987,” the copy said, “while organizing the Zapotecs to regain their lost water rights.” Why, I wondered, would a water rights activist write a poem about a holy person who takes away a village’s water? A few days later, a colleague gave me a copy of the poem that Cruz Martinez had written, called “la voz del poeta canta” (“the poet’s voice sings”), which he published in San Jerónimo Ixtepec, Mexico, in 1984. The only thing that his poem has in common with the children’s book is the name of its central character. In Cruz Martinez’s poem, Lucía Zenteno, with her skirt full of butterflies, roams the land, stealing not only the attention of all the men, but the men themselves. She has no friends, no morals, and no conscience. She comes to wreak havoc and bring misery; and when she gets angry, she takes away the river and everything that depends on water to live. And she doesn’t return. She is that pure evil we warn our children about and guard our men from. Last week, I viewed Maureen Gosling’s excellent film, “Blossoms of Fire,” and all of this came together for me. A brief digression to set Cruz Martinez’ poem into historical context: The Isthmus of Tehuantepec is one of the most fertile areas in the world and the fact that it’s an isthmus has left the land accessible to plunder. For at least four centuries, the Zapotec people here have struggled against colonialism in one form or another. In 1981, the people of Juchitán successfully challenged the one-party system of the PRI (Revolutionary Independence Party), which had ruled for over 60 years, and voted in a progressive party, COCEI (Coalition of Workers, Peasants and Students of the Isthmus). Under the new government, roads and schools, clinics and libraries were built, public programs flourished and there was a cultural flowering. In 1983, to break the power of COCEI, the PRI sent in repressive forces that openly murdered and disappeared movement leaders, who became known as “los desaparecidos.” Fighting for the land and water was their crime, and Alejandro Cruz Martinez was one of the many casualties of this repression. This is exactly what water rights struggles are about: right-wing governments and vulture capitalists’ diverting the water and effectively killing villages. This happens all over the world, and the Indigenous peoples rarely, if ever, win. Africa is rife with this history, over and over; where once were fields full of food for entire populations, nothing is left but deserts. Nowhere in reality—or in Cruz Martinez’s poem—does the Zapotec people’s begging and pleading bring back the water once it’s been stolen. That is what Cruz Martinez died for: the basic right to life. There is nothing real or dignified in Children’s Book Press’s teaching our children about how Zapotec villagers begged for life-giving water, and then honored the one who stole it in the first place. Rather, it’s an insult to the memory of Alejandro Cruz Martinez and the Zapotec members of COCEI who struggled and died for access to the resources on their own land. The Woman Who Outshone the Sun is not recommended. Note: Below is Alejandro Cruz Martinez's original poem, la voz del poeta canta, and its English translation, The Poet's Voice Sings. Thanks for writing about this. I found this post after we read the book, I never would have known the true backstory without this. Thank you for your comment, Skye. How has our evaluation changed your perception of this book? Did you say anything on your blog about your initial perception and what you found out? I only blog books I wholeheartedly recommend, so I'm simply not blogging about it. You know, I wonder if the (mis)writers were using the Bible story of Noah as a basis to corrupt the original poem. I mean, it makes sense. A lot of people, from all over the planet, have criticized that Bible story because it shows God as greedy for love and attention, to the point that He kills anybody who doesn't respect Him (in a water-based way, no less), until they honor Him, and only then does He promise not to be so murderous. Of course, as the stories of Sodom & Gomorrah, the Ten Plagues, and Joshua killing all the Canaanites show, that first instance of divine slaughter and/or torment is only the tip of the iceberg. No wonder Columbus, Cortez, et al. felt so entitled to murder and torture non-Christian Amerindians. Hope more fouled-up books like these don't get written. Who knows what victims the West will blame for its own crimes next. That's a great theoretical analysis, Sam! The author(s) certainly may have used any of many biblical stories, but I'm not sure they went that far. Alejandro Cruz Martinez's original poem is about a supernatural woman who is bad to the bone, so to speak. Always was, always will be. She comes to wreak havoc and bring misery--and does. In the poem, she represents the right-wing governments and vulture capitalists who steal and divert the water and destroy villages. 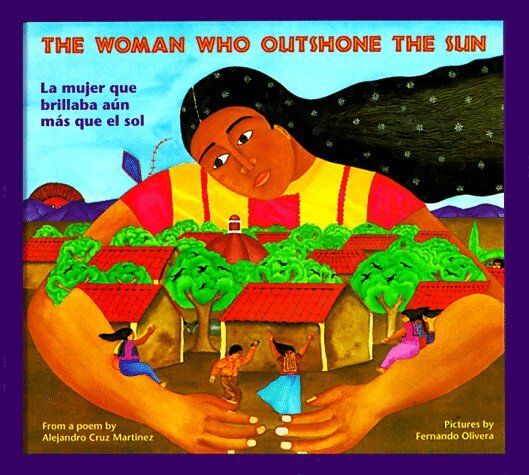 In THE WOMAN WHO OUTSHONE THE SUN, the author(s) transform the poem's Lucia Zenteno into a beautiful, supernatural feminist, who takes revenge on the jealous villagers until she gets the apology she deserves and therefore, returns the water. Because she's really a nice, kind woman who just sort of gets riled easily. OK, Beverly. I thought of Noah because a woman who once showed me this book said to me (after we'd finished reading it) that Lucia was "like a goddess" to the villagers. But...know what I also like to imagine of this book? —What happens when books similar to Tikki Tikki Tembo and books similar to Gone with the Wind collide.— There. I said it! Any chance that you have a copy of the original poem by Alejandro Cruz Martinez? I've been searching everywhere. If you know where I might find a copy, please post! Hi, Mark. Thanks for asking. We have a copy of an English translation of Alejandro Cruz Martinez's poem, "La voz del poeta canta," so it's not the original, which we've been looking for as well. If you'd like to message me on Facebook with your email address or mailing address, I'll make sure you get a copy. How's that? Hi, Mark. It's been awhile, but we finally found Alejandro Cruz Martinez's poem. You can find both the original in Spanish and its English translation after the signature line.